Did Somebody Let a Bird In? You are at:Home»Featured»Did Somebody Let a Bird In? 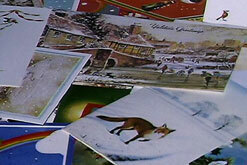 Christmas cards opened and not, scatter the surfaces of my kitchen. I however have not gotten my own out… yet. Sadly that ship has sailed and my next port will have to be Epiphany or hold off until Valentines. There is a pineapple needing slicing, resolutions that need writing, dishes, work projects and a retreat looming in just two weeks. What went wrong? It all started five days ago when my darling husband got called out to fly a trip to Kona. Poor me I would have the house all to myself for four whole days. This was an unusual turn of good luck as any mommy would know; oh the things we can accomplish when we get some time alone. I began planning and plotting immediately. Why, I bet I could clean every nook and cranny, finish a month of work, plan a retreat and still have time to spare. Day One: The sky is the limit. Well, hypothetically perhaps and realistically, not so much. I had made plans to help a friend who was widowed earlier this year, but by the time I arrived I realized my need to see a doctor for a prescription outweighed my ability to concentrate without running to the bathroom every few minutes in a fair amount of pain. (No need to expound further there) The rest of the afternoon consisted of waiting on a doctor, waiting on a prescription and waiting to get a movie since I was not going anywhere now. I asked Nic, our technologically advanced son, to “teach me to fish” sort of speak, that is, show mother how to use the DVD player. Previous attempts to learn from various other family members resulted in, “oh give it to me, let me do it.” Thus my ignorance continues to this day. He got dinner and left me a special present that came the next morning… the flu. Day Two: The bed is the limit. Basically this day and the next one are pretty much a blur. Being all by little self meant I could sarcastically shout all I wanted to about what a “great way this was to spend the rest of the year blah blah blah.” I loaded up on Nyquil hoping it wouldn’t react with the other drugs I was on and crashed at 9 pm. Day Three: Ugh. No need to check on mommy, no news is good news, right? My routine consisted of bed, bathroom, couch. Repeat. Day Four, New Years Eve: Sheer fortitude drove me to at least, “accomplish something” so I could look at myself in the mirror, slacker! We women are not very kind to ourselves and rarely let ourselves off the hook. I was actually feeling a lot better after all that R & R, and made some attempts at progress. My husband called from the islands and after hearing my plight stated, “Gosh, I guess you are human after all.” Hardy har har, what a comedian. Day Five: New beginnings, and a new year. After dressing and heading to make some efforts in the kitchen my honey comes home after flying an all-nighter and heads up to bed. Upon waking and coming down the stairs, he queries, “Did somebody bring a bird in here?” I can only assume he sees the feather carpet. Now I have to say, this is not rocket science that we are talking about here. He knows the only “somebody’s” in the house are he and I. The “bird killer” and the “barker” are not somebody’s. I did not choose to turn on the vacuum while he slept, however that will not stop me while he watches the game. To top it all off as he looked at my prescription bottles he commented, “If you had gotten these at Fry’s we could have gotten another ten cents off in gas.” Silly, thoughtless me, I was just trying to fill my drugs faster so I could to feel better NOW. The moral of this pathetic tale is this: If you want to make God laugh, tell Him your plans. Have a blessed and very productive New Year. Next Article Want to Lose Weight? Find Out How the Experts Do It!